I’m attempting to instill a soupçon of order into my writings and random postings, and what better way than to do so alongside other keen food bloggers. So, I signed up for the Daring Cooks. There is a new culinary challenge listed every month and we all reveal our creations on the 14th – which is today. 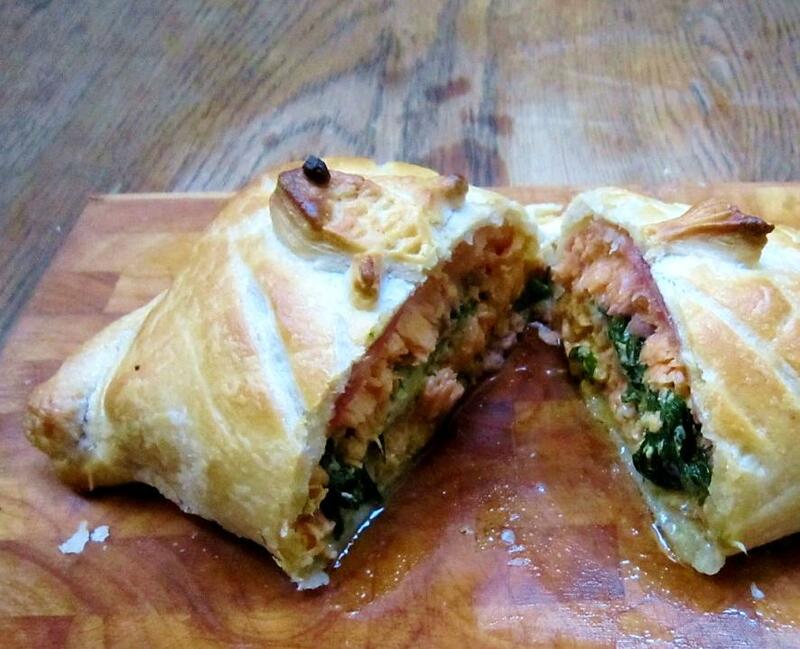 Our lovely Monkey Queen of Don’t Make Me Call My Flying Monkeys, was our May Daring Cooks’ hostess and she challenged us to dive into the world of en Croute! We were encouraged to make Beef Wellington, Stuffed Mushroom en Croute and to bring our kids into the challenge by encouraging them to create their own en Croute recipes! This was the perfect challenge to start with, as I love all things pastry, so I’m obviously a huge fan off wrapping tasty morsels in it. As the price of beef fillet steaks or tenderloin is way out of my budget, I opted for a fishy filling. I’m still in the throes of incorporating wild garlic into pretty much everything this month, so what better to sandwich my locally caught rainbow trout fillets? It’s a match made with heaven, especially when spiked with lemon zest and nutmeg. In summer months, when the scent of wild garlic in the woods is but a distant memory, I’ve been known to stuff my trout (you could use salmon of course) with watercress, as a pleasant peppery replacement, but when available wild garlic really makes the perfect pairing. Instead of a crepe preventing a soggy bottom, I wrapped the trout fillets in salty Parma ham and was pleased that the Italian approved of his ‘unusual’ parcel. 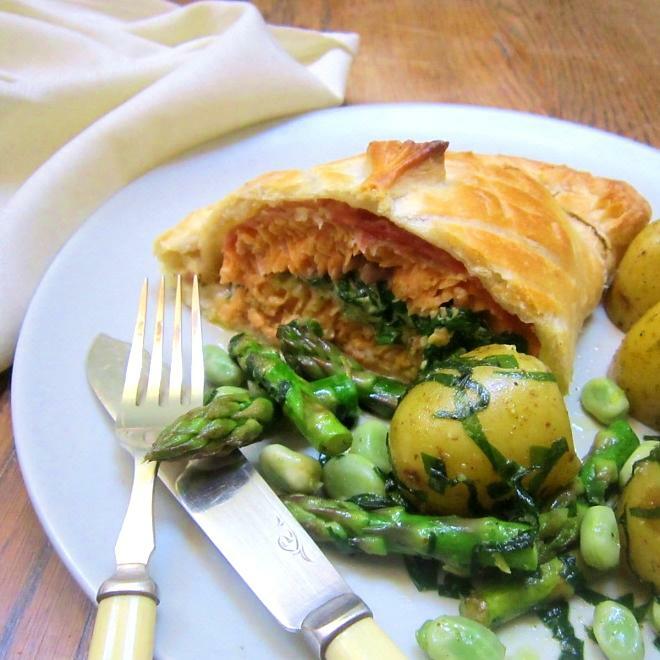 This is my ode to the belated springtime (though it is STILL drizzling with a chill in the air as I type this), so I felt it was only right to accompany the surprisingly light and delicately flavoured en croute with a lemony new potato, broad bean and asparagus salad – dressed with more shreds of wild garlic of course. I must say, thanks again to the Daring Cooks for an excuse to wrap things in buttery flaky pastry – it was absolutely delicious! METHOD: Wash the wild garlic thoroughly and pat dry. Chop and knead into the butter, so it forms a thick paste. Add the lemon zest, nutmeg and thick cream, season and chill. Lay the slices of Parma ham out so they overlap each other slightly and lay a trout fillet on top. Season, and smear on the wild garlic paste. Add the second, similarly sized trout fillet on top, season and carefully fold the Parma ham slices over, so the parcel is tightly wrapped and well-sealed. Transfer onto the rolled out pastry, brush milk round the edges and crimp. It is usual to use egg wash, for the glazed effect on baking, but as I said, saving pennies here so I use milk. Bake in a pre-heated oven at 200˚C for twenty to twenty-five minutes, so the pasty is golden brown. Serve with a zesty lemony new potato salad for a taste of Spring, and a chilled glass of Sancerre, and enjoy! *If using stuffing the trout fillets with what is essentially mild garlic butter, you do need a good seal, so I wrap them well with the Parma ham. If you didn’t want to use Parma ham or it wasn’t available, you could use a tablespoon of crème fraiche instead of the butter and drizzle of cream or you could try wrapping the trout with blanched wild garlic leaves! Many folk use cream cheese, but I am not a huge fan of the combination of cream cheese and fish – yes, even in smoked salmon bagels! 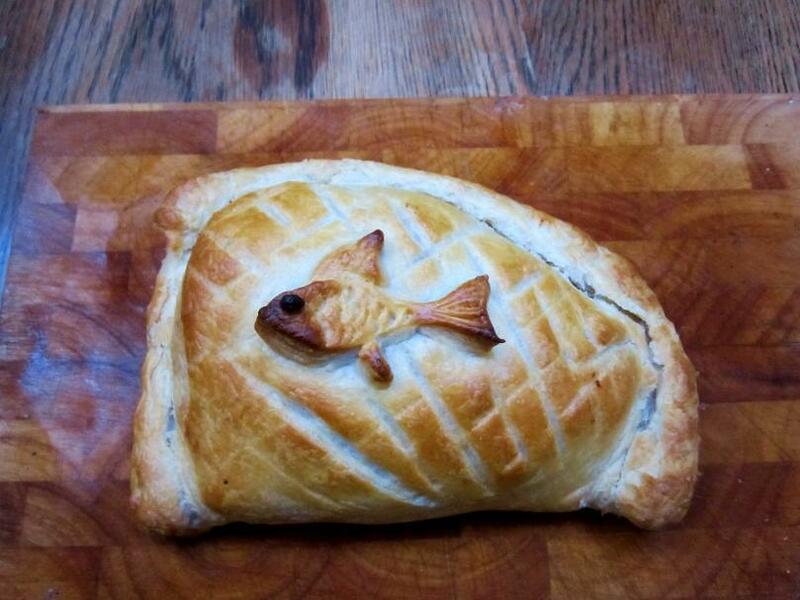 Welcome, and may I say that your en croute is beautiful. Love the finished plate AND the photos. Thank you so much for participating. Great job! Thanks so much for a great challenge – looking forward to next months already!